2014. 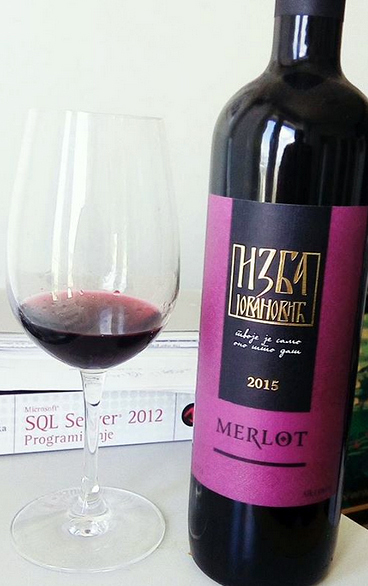 The first vintage of this wine was one of the worst years for local wine growers, But Adrijana i Ivan were bravely appeared in the market with Izba 2014, a thin body, but very fruity, balanced and elegant Merlot, which immediately attracted domestic wine lovers. 2015.And so we welcomed the successor to which much anticipated.From the very beginning (at the appearance at the wine fair in Lazarevac) a strong,jam-like combination of plum and cherry, affter half year much better, gold at Emozioni dal Mondoin Bergamu 2017,and then something happened, that autumn the wine somehow went to “green”, and got some weird herbal taste :(. 2016.Now it seems to me that we have the right thing here:Color dark ruby red.Mild smell,blueberry, cherry and plum at background. Body is medium. In the mouth fruity,blueberry, blackberry and a little oak.Good balans, noticeable tannins. Medium long finish with of plenty fruit acids. It is not yet at the peak of maturity,promising. What else? In my opinion, this is one of the most beautiful labels in Serbian red wines, styled for looks like as medieval Serbian manuscripts but very modern and elegant too. This movie has sorrou-sweet taste which no like to the taste of this wine. Similarly is : the main heroes are musicians, endlessly crammed, as well and couple Jovanovic, winemakers. And movie is good, just like this wine.